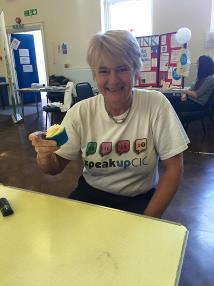 SpeakUpCIC	attended	a	Mental	Health	Awareness	Event	at	Cliftonville	Community	Centre	on	the	9th	of	October	to	commemorate	World	Mental	Health	Day. We	were	joined	by	a	host	of	other	organisations	that	support	local	people	in	their	recovery. It	was	a	great	day	for	all	involved	and	awareness	was	raised	about	local	services. Thank	you	to	all	the	volunteers	who	helped	us	on	the	day	and	the	event	organisers	for	making	it	possible.